SANTA BARBARA — Phase 4 of Santa Barbara Harbor’s Marina One rebuild has begun, leaving some slip tenants in a precarious situation. The 10-year, multiphase approach to rebuilding 14 of the 16 dock fingers that make up the 500-slip marina has been going as planned, so far. However, the impending reconstruction scheduled for nearly all of the harbor’s 40-foot slips has Santa Barbara’s waterfront facilities manager Karl Treiberg searching for ways to keep all of the boats in the harbor. For every phase so far, project managers been able to relocate the vessels displaced due to construction within Santa Barbara Harbor. But with nearly all of the 40-foot slips about to be put out of commission, the city is having trouble finding space for the larger boats. At the Harbor Commission’s Nov. 15 meeting, Treiberg outlined possibilities for boaters who will be moved out of their slips along Marina One’s fingers M and L during the Phase 4 construction period. Similar to the recently completed Phases 2 and 3 of the project, construction of Phase 4 will include demolition of the old docks, installation of the new docks and installation of the new electrical and water systems on the docks. Finger M consists of 36 slips in the 40-foot range and one 90-foot end-tie. Finger L consists of 44 slips in the 30-foot range, with one 60-foot end-tie. The harbor has around 35 slips open for transient boaters, and it has been using those slips in the previous rebuild phases to accommodate boats displaced by the construction. But the 40-foot boats on Finger M will have trouble fitting in those spaces, as most are designed for smaller vessels. Some boats will be rafted up along the sides of other vessels at the end of fingers R, S and Q in the marina, and they will have limited electrical and water hookups during that time. 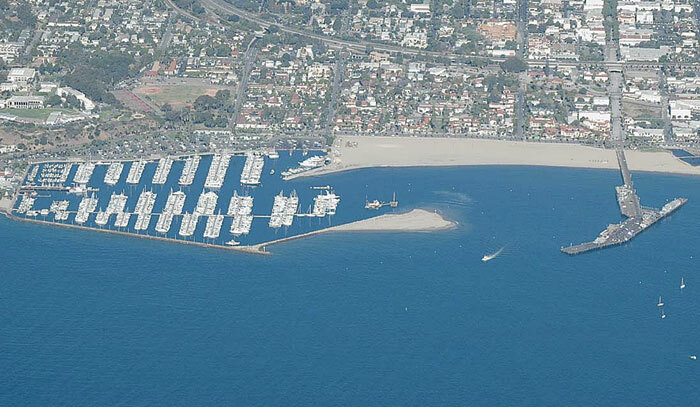 “If we have to displace boaters, and they go down to Ventura or Channel Islands Harbor, we will be compensating them the rate difference for the slip space down there compared to what they pay here,” Treiberg said. Santa Barbara’s Waterfront Department sent out letters to slip tenants in L and M, asking if they would be willing to be voluntarily relocated to a different harbor and receive the city’s compensation for the move. Treiberg said that if there were not enough volunteers by the time they needed the vessels off the docks, boats would be selected based on their slip assignment — and boaters with the shortest amount of time as slip permittees would be asked to move first. Phase 4 is expected to take around three months to complete, starting with M Finger construction to be completed in mid-January and L Finger construction to finish at the end of February. Once each finger is completed, the boats can return to newly rebuilt slips. The Marina One replacement project began in 2009, with the first phase of construction targeting a replacement of the marina’s main headwalk. Phases 2 through 4 were combined into one construction bid awarded to Bellingham Marine Industries in 2010, for a cost of $4.2 million. Phase 2 included O and P fingers, and was completed in spring 2011. Phase 3 included N Finger and was completed in fall 2011. Phase 4 is expected to cost $1.4 million to complete. It is being funded by a California Department of Boating and Waterways (Cal Boating) loan of $1.7 million. The Waterfront Department is hoping upcoming phases 5-8, which cover Marina One’s fingers E through K, will be granted additional loan funding from Cal Boating, and it has submitted a $7.3 million loan application for those phases. So far, the department has included $1.9 million in its current budget for the Phase 5 construction project, but the funds must still be approved by the Boating and Waterways Commission. Phase 5 construction is not expected to take place until 2015. Santa Barbara Harbor’s annual fall cycle of dredging the Federal Channel commenced Thanksgiving weekend, with dredge contractor AIS Construction beginning to mobilize its dredge yard on the West Beach near Stearns Wharf. The dredging project is part of the harbor’s six-year maintenance dredging program prepared by the Army Corps of Engineers in 2010. The program allows for 320,000 cubic yards of sediment to be dredged from the harbor’s main channel area per year, which is distributed between two dredging cycles: a fall dredging period and a spring dredging period. This fall, AIS is expected to focus most of its allotted 160,000 cubic yards of sediment removal on the harbor’s sandspit, which is considered a “feeder” beach for the harbor’s entrance channel. It appears larger than normal this year. “The sandspit has a tremendous amount of sand on it right now,” said waterfront facilities manager Karl Treiberg. Over the past few years, the harbor has been averaging around 270,000 cubic yards of material removed each year, but Treiberg expects that with the sandspit so large, the dredging contractor will probably be approaching the 320,000 cubic yard limit for this year. The dredged material is sent through a pipeline down the coast to an area just off Santa Barbara’s East Beach. There, the sediment will be discharged. Phase 4 of the harbor’s breakwater cap repair project is complete, resulting in the completion of the $1.9 million project that was started in 2004. Phase 4 construction started Sept. 24 with the demolition of eight of the remaining nine panels of sidewalk and parapet wall along the curved section of the breakwater. The demolition, conducted by Brough Construction, was completed in two weeks. However, construction of the new cap ran into some complications: High tides and large swells led to the delay of installing the reinforced rebar and concrete pouring. Once the rebar was in place, the contractor poured concrete for seven of the sections of the sidewalk and replaced a slab of concrete in front of the Marina One gangway that was part of the original 1930 breakwater. Most of the wall sections in need of repair have been reconstructed, adding much-needed protection to the harbor from coastal storms and large waves. The final two concrete panels adjacent to Marina One were finished at the end of November.